When you are waiting for a train to arrive or a ship to berth or for a plane to land at an airport, or even a bus to come in, you have a feeling of suppressed excitement, anticipation, eagerness, and even expected pleasure, and that is how it was for us as we waited for the train at Natya Railway Station. When we were teenagers at Natya in the early war years, "meeting the train at night" was a social occasion as we seldom had get-togethers. "Meeting the train" meant going into Natya to meet the steam train which brought grocery supplies including bread and meat, some farm requirements, mail and a variety of newspapers: The Argus, The Age, The Sun and The Weekly Times. The train left Spencer St in Melbourne at 9.00am as a passenger train, and when my mother travelled up to Natya to take up her first country school appointment in 1923, she described the 200-odd-mile trip as "deadly", especially the last part of the trip from Swan Hill - once the train left Swan Hill it became a goods train (basically) and that meant shunting, shunting, shunting at every little siding or station: Woorinen, Pira, Nyah West, Miralie, Piangil, Coonimur, Natya, Kooloonong, and Koorkab at the end of the line. The train took five-hours to cover the last 40-miles, and the shunting involved meant leaving empty trucks to be later loaded with bags of wheat or mallee stumps and collecting loaded rail trucks. Stock trucks were left on a Sunday or Monday for the transport for lambs to Newmarket in Melbourne for the Tuesday market. The train was due to arrive in Natya at 11.00pm but was often late. We would spend the waiting time chatting, singing, sitting around a bonfire if it was cold, and generally enjoying each other's company. After the mail was sorted we'd take our supplies and head for home. We lived only 1.5-miles from Natya so the trip didn't take very long, but Johnno Winkins had four-miles to travel, and Engstroms came in from Natya West and it was an eight-mile journey - that would have been quite a long trip home in the dark! If it was moonlight all was well, but otherwise I'd hand a hurricane lantern on the back of the gig so I could see better - of course, Bluey had no trouble seeing where he was going. I usually drove Bluey in the gig but could have used Fluffy or Dulcie, but he was my favourite, even though he was a really Nervous Nellie! He was likely to shy of real or imagined things, and you had to be alert at all times. Bluey, a tall, beautiful part Arab horse, was broken to saddle and harness, and was very comfortable to ride, was an excellent gig horse, as long as you were watchful - a strange shadow, a rustle in the grass or, worst of all, a sleepy owl awakened and suddenly flapping noisily out of a tree, could cause instant panic! His previous owner, Mrs Dow of Kooloonong, couldn't stand the stress and gave him to Dad. While that was meeting the train, a couple of years later we were catching that same train. 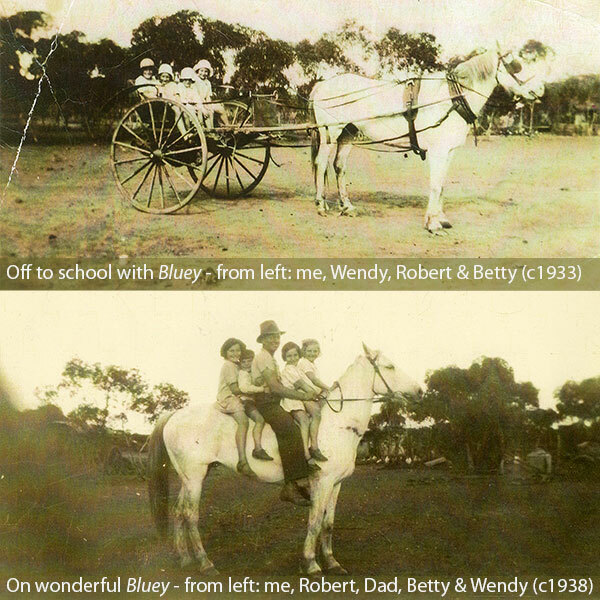 My sister Betty and I would catch that train at 5.00pm on a Friday afternoon to go home to Natya for the weekend, returning on Monday morning by catching the 1.30am back to Swan Hill. We were often joined by Hazel Watson, my good school friend from Nyah West, returning home to her family for a weekend break. We were all attending Swan Hill High School and boarding in Swan Hill. I can't say how alert we were for Monday lessons after such an early start. The train arrived in Swan Hill at 8.30am, just in time for school which began at 9.00am. We were sleep deprived, but getting home was well worth it.